Here is a short film from Blurb, the online book publishers, about a young photographer who prefers to use 35mm film. Watch. If you want my opinion I think 35mm film is a waste of time, but as I used to teach film and old processes until last year I still think there’s a roll, sorry role, for film, namely medium format. I never use my Bronica 6×4.5 now (you can make me an offer ) but I do use my Mamiya RB 67 and my panoramic 120 format Noblex – occasionally. The cost of a medium format digital back for a medium format camera is for most people prohibitive – besides 120 film is quite cheap, as is processing which one could do oneself of course, or use C41 lab processing. It’s also still possible to find Polaroid 665 pos/neg film as well. A really beautiful slow film. With 665 it’s best to overexpose by a stop to get a useless, overexposed print – that way you’ll get a good negative. It doesn’t even need fixing – washing it well under running water is sufficient. On location you can even wait till you get back to civilisation as the gell doesn’t dry hard for hours. You can buy it on Ebay or Amazon. If you don’t have a darkroom then you’ll need a scanner. I use a flatbed Epson 4990 (about £300 or less on Ebay) with transparency head. A friend has an Imacon which costs thousands and frankly when we both scanned my Ilford XP2 120 neg film you couldn’t see the difference. The Epson is not so efficient with transparency film and is pretty useless for 35mm. I don’t recommend transparency film; you’ll get a much higher dynamic range (more information – better contrast range) with more shadow and highlight detail. It’s easier to scan too. I often use 160 ISO colour film and convert to B&W after scanning. The negative is so big that the decrease in quality is really marginal though I would avoid using 400 ISO colour film. Then you’ll need better software than Epson’s own: Vue Scan is great, and cheap too. Scanning is something that I’ll cover in another article. The advantages of using film are: a much bigger file size than you’d get on a 35mm digital camera; greater sharpness; lower depth of field; the ‘feel’ of film. The sheer size of the beast will also impress a portait sitter in this digital age. I do very big prints for exhibitions sometimes up to 2 metres long and for those dimensions film is ideal and the grain lovely. But even on smaller prints you will notice the difference in quality. The RB 67 is easy to find and quite cheap – but it’s heavy! So you’ll need a sturdy tripod. But oh the quality and the build! I bought mine second hand in 1985. It’s maintenance free although the shutter speeds are slower than marked. It’s been baked in the oven *, steamed in a sauna, dropped more than once and still goes strong. By the way, never put away mechanical cameras cocked, the spring weakens. It has a swivelling back for landscape and portrait. It has the shutter in the lens. Remember the lenses don’t correspond to 35mm so a ‘normal’ is 90mm. I use ‘the beast’ for my set-piece shots in the Belle series sometimes, although I usually shoot digital as well. I usually use it only in interiors but I did lug it and 3 lenses down a gorge for the Genius Loci image – and I’m really proud of the achievement! You don’t need a Polaroid back (though the 665 film is really nice) you can use your digital camera. 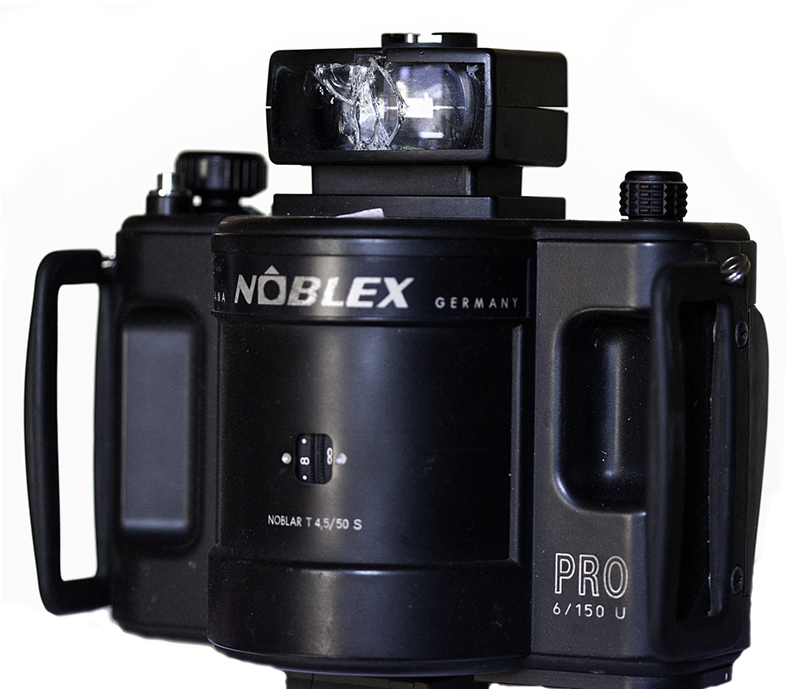 The Noblex is a really primitive camera, as you’d expect from a camera made in East Germany, but reliable whereas the similar Russian Horizon is not. My Noblex was dropped – note the viewfinder – from a not inconsiderable height when I slipped in the snow off the roof of the equally battered Land Rover (photo). I now have a rubber mat stuck on the roof. It comes from Dresden though mine was manufactured after the wall came down. If you want to wallow in communist era nostalgia: streets with no cars, or advertising, or even people come to that, look at this photographer’s site DDR. The drum revolves, once to pick up speed, the second takes the picture. There are 6 shots per 120 roll (56x120mm). 146° field of view. The lens would be the equivalent of a 35mm. It has no focus you have to use the f stop, but depth of field isn’t bad even on f4.5. One handy feature is the multiple exposure button: repeated exposures allow for a higher f stop and blurs the motion nicely on a seascape for instance. Filters are magnetic and have to be placed on the lens using tweezers! There is a shift mechanism for architectural shots – but you have to remember to return it to the normal position after. If you add to this that the camera is heavy and also the viewfinder very approximate (mine especially) you’ll realise that the Noblex experience is not for the faint-hearted! I usually use 160 ISO colour film and then convert to B&W after scanning if necessary. The negative is so big, grain isn’t really a problem though I’d advise against using 400 ISO colour film for B&W. I rarely use the Noblex Pan camera now as I prefer digital stitching, although there are occasions when the old workhouse comes into its own: for example an aerial shot from a micro-light – you can’t stitch that! It’s quite fun to use it for group photos – or even outdoor portaits with a crazy tilt (above). I use a whistle to attract people’s attention – they love it! I used it in the British Museum because I wanted to hand-hold and also tilt the camera. I have a 2 metre long print hanging on our wall at home, you can pick out every detail. *I had nowhere to hide my camera equipment when I was working by the seaside so I stored 2 Nikons and the RB in the only place I thought a burglar wouldn’t look, in the gas oven. Sadly it had an electric grill. One evening I smelled burning plastic, I’d turned on the grill by mistake. 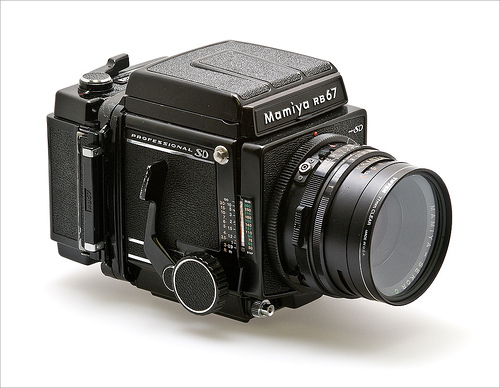 The Nikon FE2 looked like a melted ice cream and never worked again, but the FM survived as did the Mamiya. FADU is the natural home for anyone with an interest in the use of film and the darkroom, whether you are an amateur or professional. On FADU you can show your work, exchange tips and techniques, and correspond with many like minded individuals. APUG.ORG is an international community of like minded individuals devoted to traditional (non-digital) photographic processes.